1. "We've learned that sleep before learning helps prepare your brain for initial formation of memories," says Dr. Matthew Walker, a sleep scientist at the University of California, Berkeley (Duckett, 2013). 2. 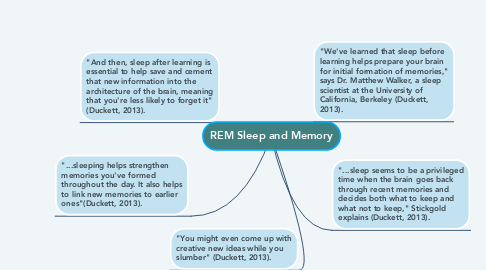 "And then, sleep after learning is essential to help save and cement that new information into the architecture of the brain, meaning that you're less likely to forget it" (Duckett, 2013). 3. "...sleep seems to be a privileged time when the brain goes back through recent memories and decides both what to keep and what not to keep," Stickgold explains (Duckett, 2013). 4. "...sleeping helps strengthen memories you've formed throughout the day. It also helps to link new memories to earlier ones"(Duckett, 2013). 5. "You might even come up with creative new ideas while you slumber" (Duckett, 2013).